Reversible denim and jute jacket with turned up cuffs worn with a matching blue striped denim bustier. We are involve in offering superior quality Jute Net Saree. These sarees are made from high quality of raw material which ensure durability at its user end. These sarees are available in various designer and attractive patterns which enhances the beauty of every lady who wears it. As an affluent name of this domain, we hold expertise in providing high quality range of Jute Pattu Saree. We Manufacture A Different Type Quality Raw Material Products In Market. Jute silk half half with attached cutword border in mathapati & pallu & uppada & golden beads in border. the flagship company of the group. The group has been named on the cheviot jute mill unit located in budge budge, 24 parganas, west bengal, about 26 kms from kolkata. Orange- rust jute padded blouse with golden tissue shoulder patch is designed in a sweetheart neck and with a knot at the back. 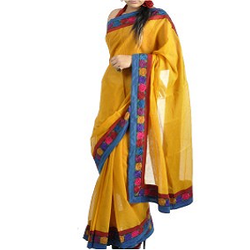 We are the leading trader and supplier of Designer and Fancy Jute Sarees. These Sarees have Kundan and Resham work on their border. Design Concept: Hand-woven jute silk in half & half style with hand kundan work & golden beads border & pallu. Color: Elegant black and Mesmerizing Red combination.heavy gold zardosi border. We offer to our customer wide range of Jute Embroidery Suit. Jute kurti with Front Phulkari work and work on sleeves.